As it turns out, transporting a space shuttle through city streets is a "Big Endeavour." 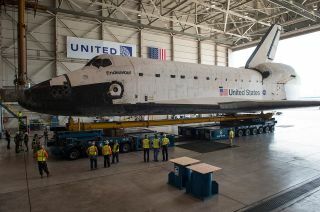 Space shuttle Endeavour, the youngest of NASA's retired orbiters, will depart later this week on a road trip from Los Angeles International Airport (LAX) to its new exhibition at the California Science Center (CSC). The two-day, 12-mile (19 kilometer) journey follows Endeavour's delivery to L.A.atop a jumbo jet last month. The move, which will begin hours before dawn on Friday morning (Oct. 12) and end after nightfall the next day has been dubbed "Mission 26: The Big Endeavour." While it was in service to NASA, Endeavour flew 25 missions to space between 1992 and 2011. Mission 26 will take Endeavour through Inglewood and Los Angeles, including passing over the freeway, and pausing for celebrations outside the former indoor arena of the Los Angeles Lakers and at a street intersection where "Fame" actress Debbie Allen has choreographed a tribute. Endeavour will make the journey atop a modified NASA overland transporter, driven most of the time by four self-powered, computer-controlled vehicles. For a brief stretch though, the shuttle will be towed by a stock Toyota Tundra pickup truck. Despite being initially promoted by Los Angeles' mayor as the "mother of all parades," the logistics of transporting a spacecraft with a 78-foot (24 meter) wingspan and a 58-foot-tall (18 meter) tail required the police to shut down streets and sidewalks, limiting public viewing to only a few designated areas along the route. Still, tens of thousands of residents and visitors are expected turn out to witness Endeavour's slow trek to its new home. The Inglewood Police Department said it is expecting between 10,000 and 14,000 people to attend the event at the arena.